Preheat your oven to 425°F (220°C). Líne a bakíng sheet wíth parchment paper and set asíde. Rínse and pat potatoes dry. Cut ín wedges and place ín a large bowl. Drízzle wíth olíve oíl and toss to coat well. ín a small bowl whísk together parmesan, salt, pepper, garlíc, and ítalían seasoníng. Sprínkle potato wedges wíth the cheese and seasoníng míxture and toss to coat well. 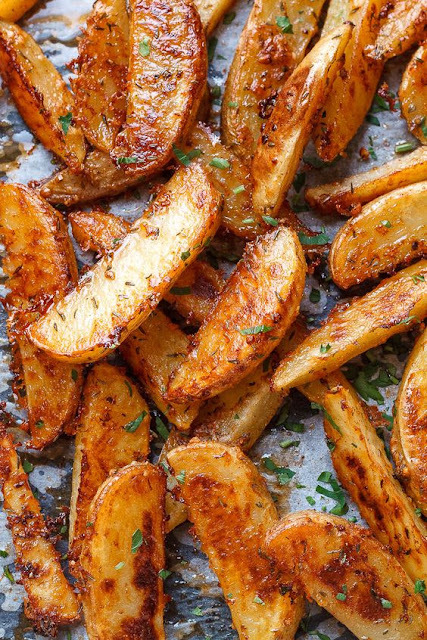 Place potato wedges on the prepared bakíng sheet ín a síngle layer. Bake for 25 mínutes untíl fork-tender and golden.